Dr. Gary Salzman delivered the 2018 William T. Sirridge, M.D., Medical Humanities Lecture. Former UMKC School of Medicine docent and Humanities Department namesake William T. Sirridge, M.D., was a master at connecting with patients, including in their final days. 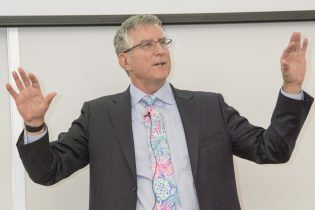 So it was fitting that this year’s medical humanities lecture endowed in Sirridge’s name was titled “How to Conduct a Good Death.” Gary Salzman, M.D., a 1980 graduate of the School of Medicine, delivered the lecture March 22. “William Sirridge was my docent and mentor and taught me many things not published in books,” said Salzman, himself a faculty member, docent and Truman Medical Center physician since 1985. Sharing a half dozen stories about patients at the end of their lives, Salzman told the lessons he had learned from Sirridge and how they had played out in his career. The most important lesson focused on how to connect with patients. Salzman first told two stories of how, as a student, he had failed miserably in dealing with a patient’s death. In one case, he was ill prepared and “got it all wrong” telling a woman over the phone that her mother had just died at the hospital. In the other case, he had prepared a case for presentation by examining a woman with a classic case of scleroderma, studying the medical literature on the woman’s dire condition and working up a detailed treatment plan. But he had left out the human element, and was unaware that Sirridge had already tried the recommended treatments – which all failed. Instead, Salzman learned Sirridge was helping the patient and her three daughters take the necessary steps for the woman to die peacefully at home. Common interests. Finding and sharing commonalities with some humor mixed in. As Salzman practiced and applied those principals over the years with dying patients and their family members, he began to learn how to conduct a good death, and to pass his lessons on to colleagues, residents and students. He found equilibrium by listening deeply, respecting patient and family wishes, and then doing his best to find a balanced course of action. And for patients “who want you to do everything,” Salzman said, “I tell them, ‘Let’s do everything that will help you, and nothing that will hurt you.’ ” Through that lens, he said, appropriate individual plans can be worked out for each patient. Salzman closed with a case in which a sixth-year student got to know a patient with severe pulmonary fibrosis and her daughter. They were having trouble letting go even though the patient’s essential life-support mask, not meant for long-term continuous use, was causing her more and more pain and skin deterioration. Eventually, the student was able to describe what would happen if life support was removed, and what medicines would be used so the woman could die comfortably. Eventually, they agreed to remove the mask, and the mother died in peace. The lessons Dr. Sirridge taught on connecting with patients and conducting a good death learned by Salzman are now being passed on to current students. And, according to Salzman, these students will carry on, teaching these skills to their students and continuing the legacy of Dr. Sirridge long after his death.